Desk calendars do more than just tell us what day and month it is. For some corporations, it serves as a way to subtly market their products and services. Because the desk calendar sits on the desk all day, it is easier for your customers to see what products or services you offer. The easiest way to make a desk calendar is to use a desk calendar template. Templates are easy to both find and use. Simply download the calendar template and edit using your editing software of choice. This has proven to be the most time-saving method when making a desk calendar. By knowing your market, you will know what products and services you should include in your desk calendar. Since the desk calendar will be in plain sight at all times, it becomes a constant source of advertising. Be sure to tailor fit your calendar to your intended market. Be sure to use only high-quality pictures and images for your desk calendar. The last thing you want is to give away desk calendars to clients that are filled with low-quality, blurry, or even pixelated images. You can use high quality and royalty free images online, or high-quality pictures that you take for a more personal touch. As mentioned, the desk calendar does more than just tell you the month and day. It is a constant source of advertisement. When adding descriptions of products and services be sure to keep these descriptions brief, direct, and straight to the point. You do not want to take up too much space just to describe your products and services. Organizing means more than just making sure that your dates are correct. Be sure to organize your products in a way that the promotion you offer corresponds to the proper season. You would not want to promote summer events during winter now, would you? 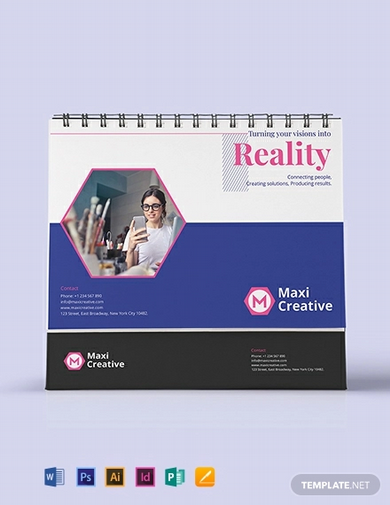 Show off your creativity with this creative agency desk calendar template. Save your best ideas for your customers without having to compromise on quality. Downloadable in multiple file types such as Adobe Illustrator, Microsoft Word, Photoshop, InDesign, Pages, and Publisher. Simply download in your choice of file type then edit. Running a law firm is tough work. Who has time to design a desk calendar from scratch? 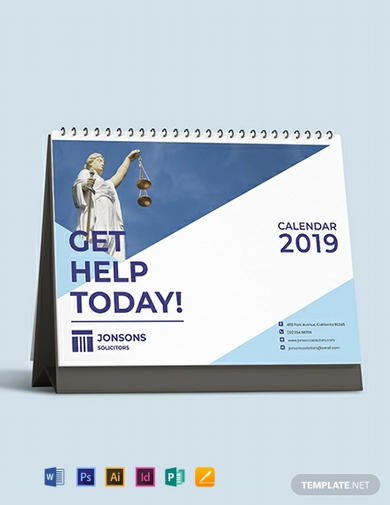 Use this law firm desk calendar template and save yourself both time and effort. Simply download in one of its available file types like Adobe Illustrator, Microsoft Word, Photoshop, and other similar file types, then edit. 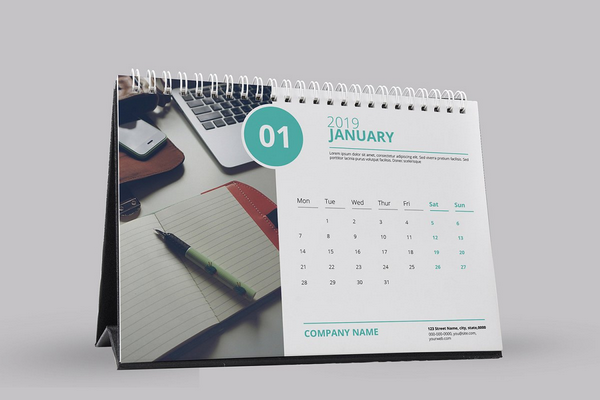 Be sure to advertise your own advertising firm with this desk calendar template. With your clients using your desk calendar on their desks, you will never be far from their minds. Simply download and edit in your go-to editing software. Available file types include Adobe Illustrator, InDesign, Pages, Publisher, and other similar file types. 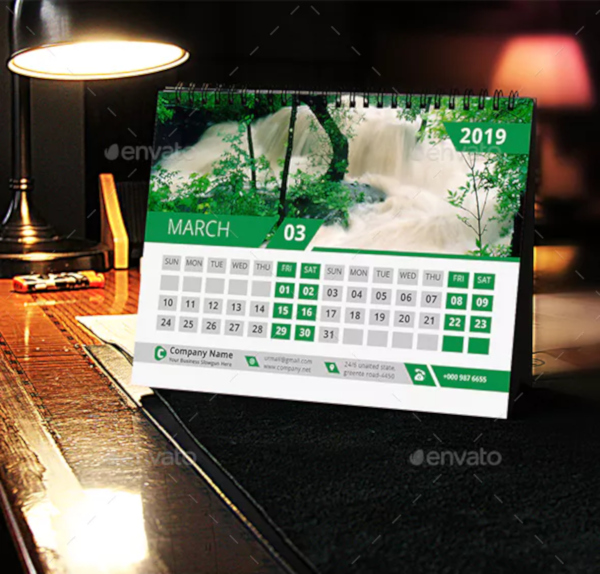 This desk calendar template is both simple and elegant. It has a straightforward design that does not distract from the images you decide to use. This template can be used to market products and services or to simply show off the sights and attractions that your locale offers. It was Albert Einstein who once said that everything should be made as simple as possible, but not simpler. This desk calendar template may have a simple design, but it gets the job done. It makes use of the available space but leaves enough white space to give it a clean look. 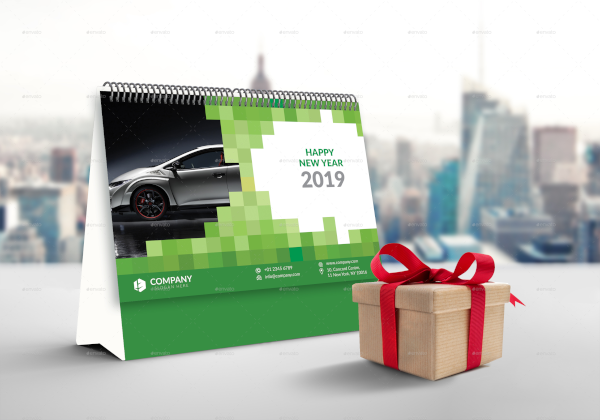 Your main goal when providing these desk calendars to your friends and clients is to advertise yourself and your company. 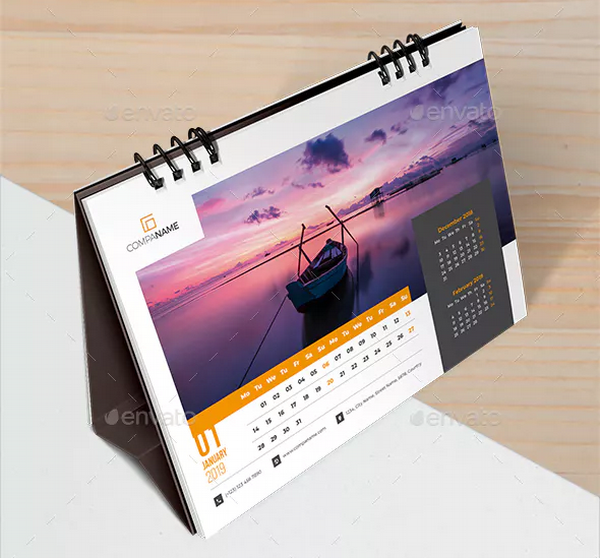 This desk calendar design template does that splendidly. Clean, elegant, and eye-catching, this desk calendar has everything you could want in a desk calendar. Be sure to take advantage of this template and show your clients everything you have to offer. 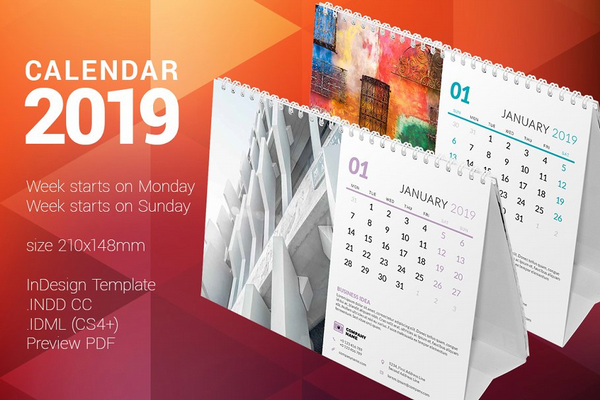 A good desk calendar can double as a brochure design or flyer if used correctly. 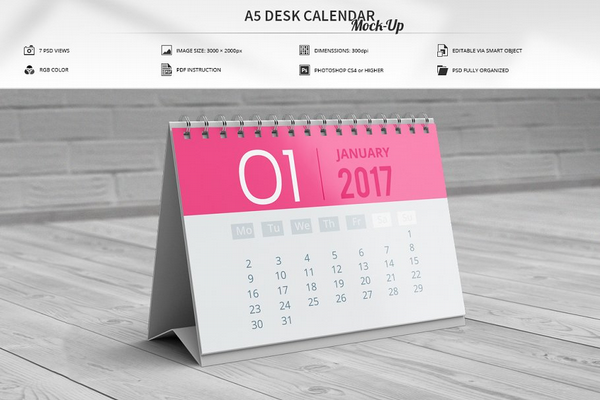 Show off your products and services with this desk calendar template. With 12 months a year, you have plenty of chances to show off what you have to offer. It is like having a year’s worth of advertising for one time printing! As your customers flip through their desk calendars monthly, they will be seeing your monthly and seasonal promotions. Take advantage of that and show them everything you and your company has to offer. Your customers will surely keep you in mind as they go about their daily activities. Sometimes, the simplest tools are the best sources of advertising. Almost everyone with a desk used a desk calendar. Be it at work or home, the calendar is ever present. Take advantage of this need and advertise your company and yourself. Show off your products and services as your clients flip through the calendar. Start the year right by making sure your client keeps you and your company in mind. 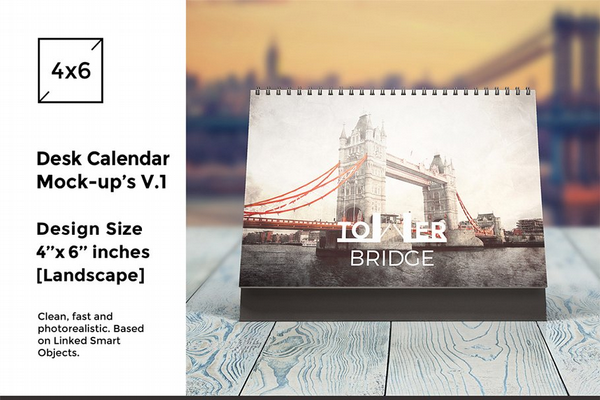 The desk calendar is a popular gift choice for business partners and clients during the holidays. This way, your clients and business partners keep you in mind because they will be seeing your company desk calendar all year round. Advertising comes in many different shapes and forms. The desk calendar is one of those. Simple yet subtle, the desk calendar makes sure that you are always in mind. 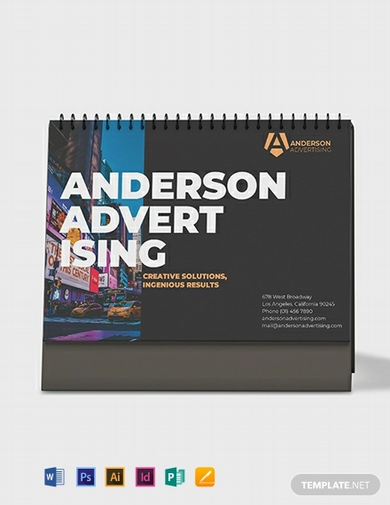 Show off your products, services, promotions, and seasonal discounts with a desk calendar. 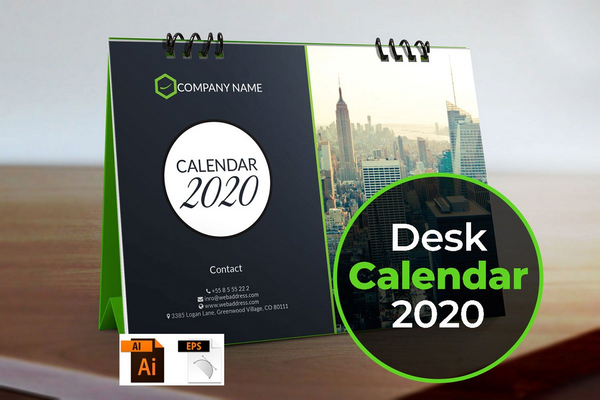 This desk calendar template is perfect for that job.